You are browsing the archive for forecast. After hours of tornado warnings yesterday with possible touchdowns, we have been flung into the icebox today! 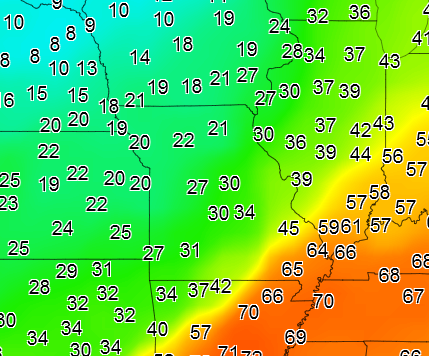 Area temperatures have fallen to right around freezing or just below in portions of the Ozarks. Meanwhile, precipitation echoes are still showing up on radar. Since the arctic air has undercut warmer air aloft, the precipitation is falling as rain or freezing rain if the temperature is at or below freezing. So, technically, ice could form on surfaces this morning. But because of recent warm temperatures, marginal cold and light precipitation, a major accumulation of ice is not expected. As the cold air gets deeper, a transition to more of a sleet or snow will occur. Again, totals are expected to be light, under half an inch. A winter weather advisory is in effect for much of the Ozarks. I’ll bring you the latest tonight on KOLR and KSFX! Cold weather is coming! This isn’t in question really as the cold front has been very consistent showing up on the long range computer models. While it still appears an arctic front will progress through the Ozarks in short order late Wednesday or early Thursday, it is always worth watching carefully especially since enough cold air is in supply to produce winter precipitation. 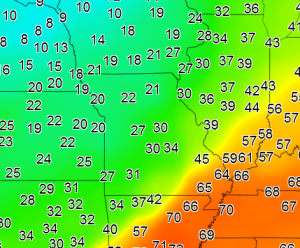 Experience dictates watching to see if “waves” of precipitation will develop along this cold front. A wave essentially means a slowing and kinking of a front. In the meantime, there is a weaker front forecast to slip through on Monday. This feature may support some showers or perhaps even a thunderstorm as it passes through. 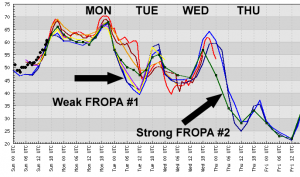 Warm air returns on Wednesday with the arctic front due in Wednesday night. 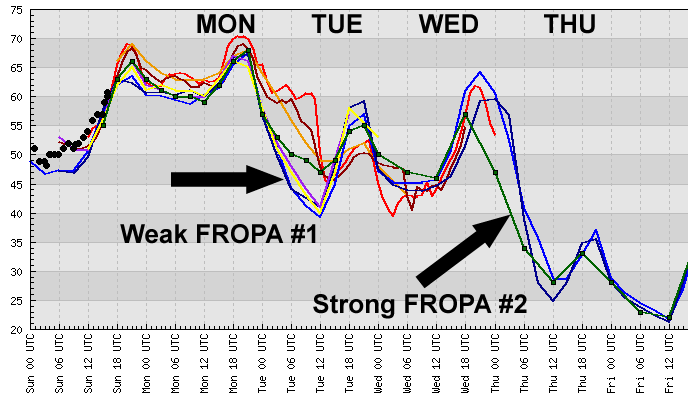 As you can see on the inserted graph, lows will be dipping down close to twenty degrees by Friday morning! The high temperature is expected to be just above freezing on Thanksgiving day. Visible Satellite Image of Earl 9/2/10 a.m. There are three landfall possibilities for “Earl”, the outer banks of North Carolina, Cape Cod and Maine. If Earl interacts with the approaching front and upper low in the right way, Maine may be the best shot at a U.S. landfall although as a much weaker tropical storm verging on extratropical low if it does. Category four Earl has made a turn overnight and is moving more northward. It has strengthened to sustained winds of 145 mph. This storm will affect the outer banks of North Carolina later tonight and hurricane warnings are in effect for this region. The upper level winds should begin to grab Earl and send it northeast on Friday. This would exclude much of the east coast from the eye but of course the wind, rain and high surf will be a threat from the Carolina’s northward during Earl’s trek. High Pressure, Come On Down! We have been beat up with heat this summer. The hot spells have been numerous and, depending on how the rest of August turns out, we may rank in the top ten hottest summers (summer on the record books is June-August). Changes in the jet stream are supportive of cooler weather starting Sunday and running through much of next week. A front will be pushed by the jet stream through the Ozarks Saturday night. This should bring our temperatures back below normal for early next week. Highs will reach into the eighties while lows fall into the sixties. A second area of high pressure should drop down mid-week, prolonging the more moderate temperatures through the rest of the week. The jet stream has featured a ridge of high pressure supporting hot air over much of the southern Plains for most of July and August with only an occasional cool front. The forecast changes over the northern Plains are sharper and longer lasting which is way we should be able to enjoy a break from the heat! I use this graph quite a bit in my blogs and recorded weather discussions. If you’d like to know more about it and how to read the time printed on the graph, read this blog. We have had several memorable runs of ninety-degree heat this summer! The first was in June from the 16-23rd. The warmest in this stretch was 93. The heat set in again from July 14-24. This time the hottest was 95 on the 18th. With a very short break, another hot run went from July 28 – August 4th and again from August 8th through yesterday. And of course, it is a near certainty that we will be in the ninties through Friday and probably Saturday too. With these latest hot weather days, 100 was reached once and 99 was the high four times! This month is much different than August of 2009 which was cool and somewhat wet. We will be in store for some cooler temperatures starting Sunday, part of a pattern change which may last much of next week. Early this evening, the National Hurricane Center (NHC) determined that a tropical depression had taken shape in the eastern Gulf of Mexico. This is the fifth tropical depression of the season. Throughout the day, a broad circulation in the middle atmosphere could be seen slowly taking shape. The status of a depression hinges on whether a circulation can be identified at sea level. Hurricane hunters did find a circulation center on this storm on the last reconnaissance flight. The NHC believes that while the Gulf sea surface temperatures are very warm, the overall pattern of upper level winds do not favor significant strengthening over the next few days. Nevertheless, tropical storm warnings have been hoisted from Destin, FL to Intracoastal City, LA. The picture shows the latest projected path of the storm. 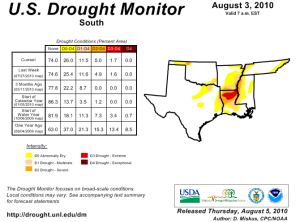 It is interesting to note that a good chunk of Louisiana under the projection cone is under serious drought conditions which also extend into eastern Arkansas and even into portions of southern Missouri. This storm could deliver much-needed rain to the drought region.